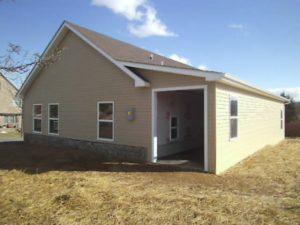 One of Valley Builder LLC’s latest projects was completed is in Shenandoah County. 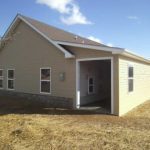 This project was a wonderful two-story, free standing garage on Schoolhouse Road in Woodstock, Virginia. 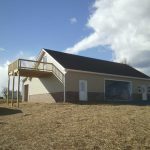 This structure is a great compliment to the single family home property and provides lots of space for work and storage that was desired by the client. When approaching the design of structure we want to ensure the client is getting everything out of the project they desire. For our Woodstock clients that was creating a space that met multiple functional needs and provided needed storage. Plus we strive to maintain consistency in outside finishes to compliment existing structures. 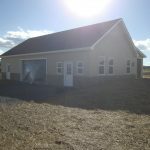 This 50’x30’ garage houses 2 separate work areas. By splitting the main level we provided for a crafting area on one side and a workshop with garage door on the other. 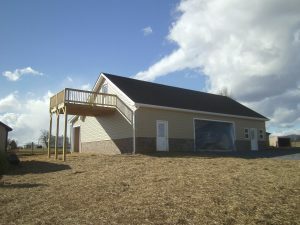 The needed storage was accommodated by the addition of a lean-to in the rear. A set of stairs inside takes you up to a 12’x12’ deck on the upper level, great for taking in the mountain view. To complete to the overall function, 200 amp service was installed and a laundry sink was added in each workspace. What more could you ask for? The need for multi use space is a common one in Woodstock, Virginia. Much of the community utilize their land and residential space to support hobbies, side jobs, or small businesses. This structure layout could easily be replicated for restoring vintage cars, storing canoes and kayaks, or even a separated office work area. Another idea would be an “in-law” suite for your out of town guest who come to experience all that Shenandoah County has to offer. Valley Builders LLC would love the opportunity to talk with you about how we could help you deliver your vision. If you are interested in discussing your project please give us a call! We provide free quotes. Thank you for your time and please share with your friends. Brian is a Class A holding contractor in the state of Virginia. 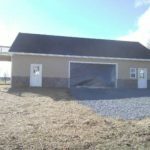 He is insured and licensed to complete any construction projects in Virginia. Brian not only is the contractor of each of his project but he completes the footers, drain tile, framing and is onsite to assure the highest quality of each of the sub-contractors. Brian wrote his companies mission and goes over it with each sub-contractor to make sure when Valley Builders is hired each and every aspect of the job is completed to that standard.